Trust Us at Work, Trust us at Home! Over the past few years, as our Commercial HVAC and Electric business continues to thrive, we’re hearing more and more commercial clients or employees asking us to service their home heating and cooling systems. Of course, we take this as a great sign! If you (or your company/your boss, etc.) is happy with the quality and professionalism we deliver during the work day, you’ll be just as pleased if not more satisfied with the comfort solutions and peace of mind we provide at your home! Based on the increase in requests we’ve seen over the past few years, we created a sweet new “Business Rewards” program for employees of our commercial customers, which rewards your loyalty! Our Business Rewards program is simple. If you are current commercial customer, we are proud to offer you and all of your staff 15% off parts, labor, repairs and maintenance at your home*. We see this as our way of saying “thank you” to our many commercial customers throughout Virginia. Residential HVAC service currently available in central VA and Tidewater regions only. Residential electrical service available in central VA only. Your commitment to us is the backbone of our success. It’s just our way of showing our commercial customers how much we value their business and the people that make it work! Our 15% off offer is valid only to employees of current commercial clients. If you are in the process of choosing between HVAC vendors for your business, this might be a nice “cherry on top” for considering Dominion Service Company! *Offer not valid on installations and can not be combined with any other offers. Discount good towards future services only. Please contact Dominion Service Company online if you have any questions regarding our Business Rewards program! You can always call our main office number at 1-800-832-0758, and we will be glad to connect you to the right folks! You can also talk to your boss or whomever at your company deals with us directly, and ask them to contact their point of contact at Dominion Service Company. We will make this process smooth, easy and efficient. As with all our services, we pride ourselves on delivering honest recommendations, timely service and a 100% satisfaction guarantee on both Commercial HVAC and Electrical and Residential Heating and Cooling. Rest assured…you’re in great hands with Dominion Service Company. 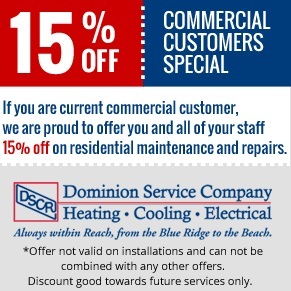 We welcome the opportunity to show you why our commercial clients throughout Central Virginia and Tidewater are excited to also be our residential clients as part of Dominion Service Company’s Business Rewards program!